Bill Bender was the last of the desert painters–the original desert painters, that is. Of the 13 artists profiled in Ed Ainsworth’s 1960 classic Painters of the Desert, Bender long outlived his compadres. He was a caring friend and a tireless resource for my incessant questions about the painters and places he knew. 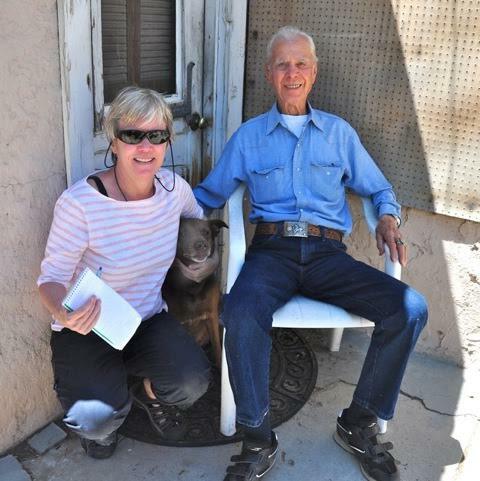 He’s been so energetic into his 90s–fixing pipes and feeding the wild birds at his Victorville ranch–that it seemed he’d live forever. But I regret to report that Bill died on his 97th birthday, January 5, 2016, at the old Route 66 homestead that had been in his family for more than 100 years. He is survived by his wife Helen. At a later date, I’ll feature a profile of this desert cowboy artist, who knew all the big names in desert and Western art: Harry Jackson, Charlie Dye, Clyde Forsythe, John Hilton, Jimmy Swinnerton, Olaf Wieghorst, Ed Borein and many more. A memorial for Salton Sea historian Jennie Kelly is slated for January 30, 2016, 1-5 pm, at the North Shore Beach and Yacht Club. The Club is normally closed to the public, but this Saturday you have a chance to visit the celebrated Albert Frey building, and to honor Jennie. Jennie single-handedly preserved much of the history of the Salton Sea, by turning her personality and tenacity to the task. Her efforts were matched by her husband, Steve Johnson. She founded the Salton Sea History Museum, which enjoyed a brief glorious tenancy in the refurbished Yacht Club. Driven by her enthusiasm for the Sea (she lived in North Shore for 35 years) she inspired long-time residents to bring in boxes of old letters, vintage ads, memorabilia and paintings. One of her interests was the early art of the Sea. She co-curated (with Deborah Martin) the inaugural exhibit on Salton Sea art, Valley of the Ancient Lake, and shined a light on the early Rancho Dos Palmas artists. This was an old Bradshaw stage stop and later a celebrity hang-out, where artists John Hilton and Barry Atwater once resided. Jennie also explored the artists of the North Shore artists colony, led by writer Ed Ainsworth. Maynard Dixon lived here briefly; Bill Bender and friends partied here. 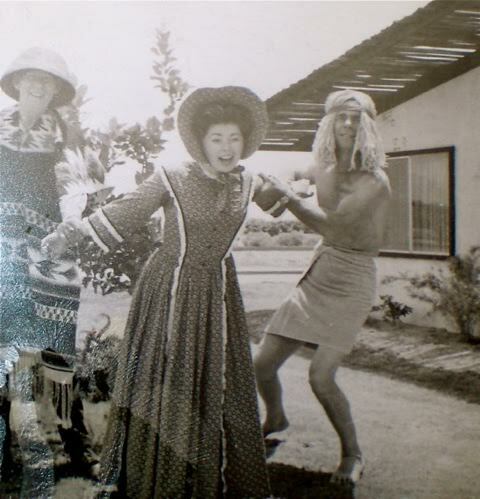 Bill Bender, in wig, and his wife Helen party with Ed Ainsworth at the North Shore camp. More than 17,000 visitors from all over the world stopped by the North Shore Yacht Club to learn about the Sea’s story, before the county abruptly closed them down in 2011. The shutdown occurred in the middle of the Valley of the Ancient Lake exhibit. Jennie had to disassemble the display with no warning, as artists from around Southern California scrambled to the Sea to pick up their evicted artwork. Jennie’s supporters are now lobbying to have the Museum put back in the largely unused Yacht Club building. “That was Jennie’s final wish,” says Johnson. Some of the great California painters–Theodore Lukits, Frank Tenney Johnson– shared an enthusiasm for moonlight. They and their friends would wander around all night, painting here and there and finding their way by the lamps on their miner’s helmets. Eric Merrell, a champion of desert painting, is reviving this time-honored enthusiasm with Nocturnes: Paintings by Eric Merrell, a new video produced and directed by Alec Ernest for LA Review of Books. The atmospheric film is sparking media attention; one critic says Merrell may be the guy to make landscape painting cool again. Spend a few minutes watching Eric explore Joshua Tree in the dark. It will make you want to get out your headlamp and give it a try. The Twentynine Palms Artists Guild was started by John Hilton and a band of high desert artists who deserve to be better known. On February 12, 2016, 7 pm, historian Pat Rimmington will talk about the history of this artist’s collective, an event sponsored by the Desert Institute at Joshua Tree National Park. Housed in an old adobe, former home of Western writer Tom Hopkins, the gallery is still in operation today. Grace Hall Hemingway, mother of Ernest, was a desert painter, as first revealed in a California Desert Art article by John Sanford. Now Grace’s art is getting more attention: A biography is underway by an Illinois writer, and a July 2016 conference (Ernest Hemingway Foundation of Oak Park), will feature a showing of Hall Hemingway’s paintings. 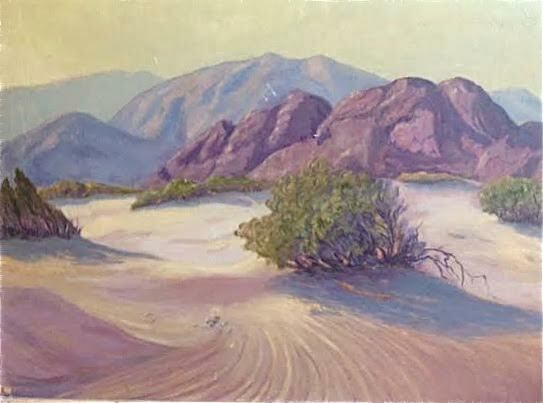 Even better for desert art fans, a rare desert painting has surfaced. Driscoll would like to find a good home for the painting, either with a devoted collector or a museum interested in Grace Hall Hemingway’s life. You can reach him here: jim.driscoll3@gmail.com. One of my favorite desert painters. “high desert artists who deserve to be better known”….thank you to you dear ann “we” are all the more enriched by your compassionate coverage!